The Split Hills and Long Hill Esker is a striking feature of the landscape between Kilbeggan and Tyrrellspass in Co. Westmeath. 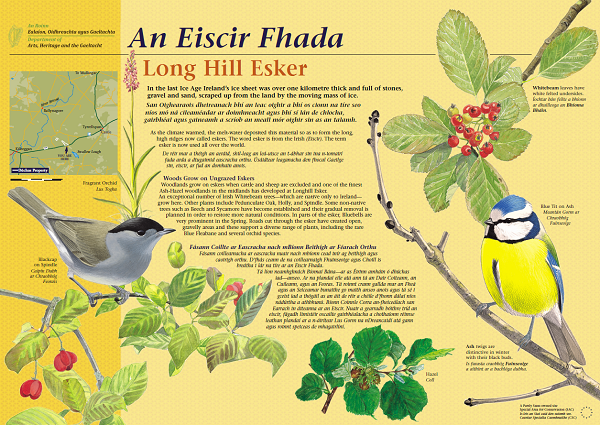 It is one of the best and longest (5km) examples of a wooded esker in Ireland. This area of semi-natural woodland boasts some fine specimens of hazel, ash, hawthorn, oak, wych elm and Irish Whitebeam. The ground flora is equally species-rich and a colourful mosaic of primroses, bluebells, ground ivy, golden saxifrages covers the woodland floor. 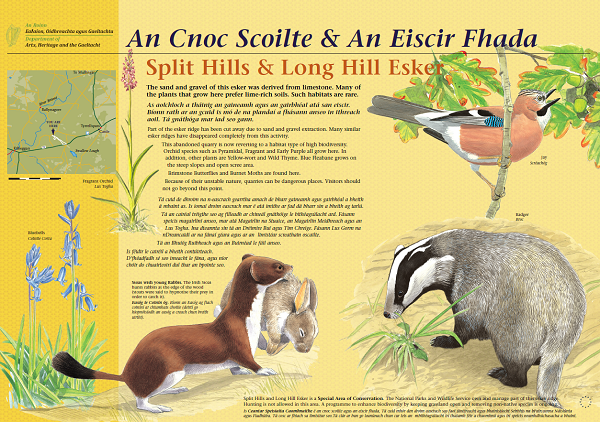 The rare Bird’s-nest orchid and Wood Fescue has also been recorded at Spilt Hills and Long Hill Esker. Interpretation panels in 13mm ecoDURA with a 2mm chamfer were used in the area.